West Bengal Council of Higher Secondary Education (WBCHSE) published WB HS Result 2015 (Uccha Madhyamik) on 29th May 2015 (friday). 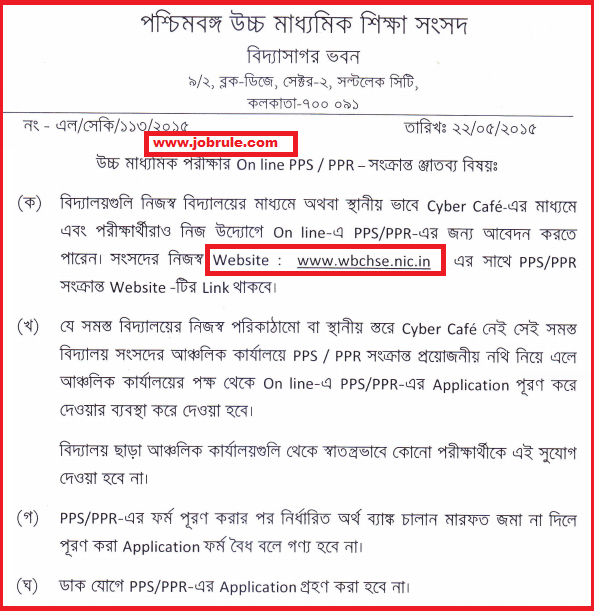 WBCHSE rules/regulations for Online Post Publication Scrutiny/Post Publication Review (PPS/PPR) of answer scripts of Higher Secondary Examination (WB HS Exam Result /PPS-PPR) 2015. Candidates/students those who want to apply for WB HS Marks Review/Scrutiny , must have to submit PPS/PPR Application form through Online Mode only. Also must have to submit specific Review Fees through proper channel (Bank Challan). 2. Application fees for WBCHSE PPS/PPR 2015 is restricted for theoretical paper only. 3. Application for review may be made in subjects for which post Publication Scrutiny (PPS) is not sought for. 5. The duly filled Online PPS/PPR Application Form along with the Bank fees to be submitted within 15 days from the date of WB HS Result 2015 Publication. 6. An incomplite or incorrect WB HS PPR-PPS Application Form 2015 shall summarilly rejected by the Council and no enquiry or correspondence shall be entertained in this regard. To read (more details) all rules & regulations of WBCHSE HS PPS/PPR System, simply visit WBCHSE official website by clicking below given direct link. You can ask your questions directly to our (Jobrule Team) representatives by submit your massage to our Facebook Page (Click here to like Jobrule Facebook Page). Best of Luck !